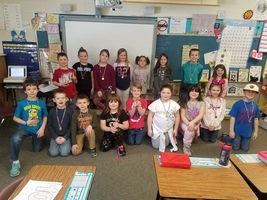 Ms. McGuiggin's 2nd graders invited parents, friends, and other students in the school to visit their Dinosaur Museum. 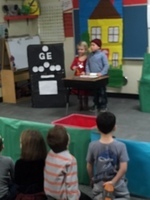 The 2nd grade scientists were eager to share their knowledge and research with everyone. 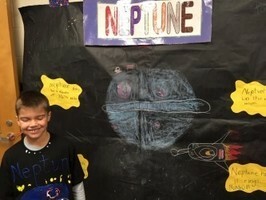 Margaret Chase Smith School's PTA hosted a Family Paint Night this Thursday. For a very low cost students and their family came to MCS and had the chains to express their creativity through painting. The event was limited to only 40 participants and everything went smoothly. 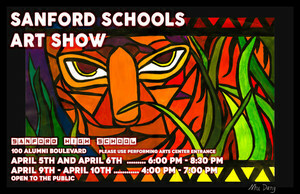 It was noted that we had many creative painters attend this great event. The SRTC Landscaping program and the Early Childhood Education program collaborated to bring us Read ME Ag to Margaret Chase Smith School! 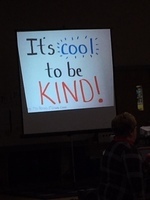 After reading the book, Kindness is Cooler, Mrs. 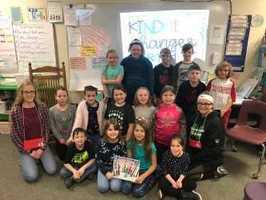 Ruler, Mrs. Deschambault's students had a homework assignment to do 5 acts of kindness at home each night for 3 nights. The rainbow is a collection of their acts of kindness. Our second graders are starting or getting ready to start their next unit in writing which is about poetry. One of the skills being taught is to look at the world around us through a different lens or perspective. 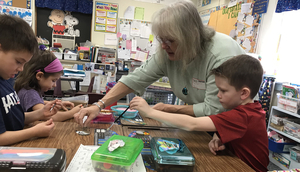 Mrs. Longfish provided her students with some fancy eyewear so, that her students could get the idea of looking through a different lens. 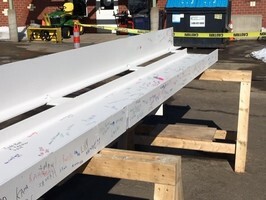 On Friday afternoon the students and staff gathered at the new addition to watch the last beam being lifted into position. 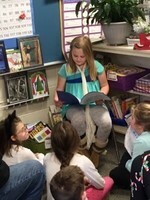 Second graders in Mrs. Arnold’s room celebrated Dr. Seuss’ Birthday Friday by participating in Read Across America. 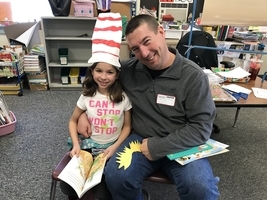 Families joined and read with the children, listened to poetry they wrote, and enjoyed projects they made in Celebration of Dr. Seuss books. He would have been 115 years old this year. We are pleased to see the progress that is being made with the construction to the addition to Margaret Chase Smith School. Additional steel has been hung that has expanded to the back of our school. 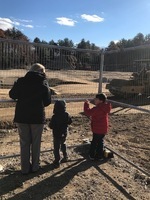 When looking at the construction project from a distance you can really see the outline of the school's addition taking shape. Last week brought in the phase where the process of hanging steel began. 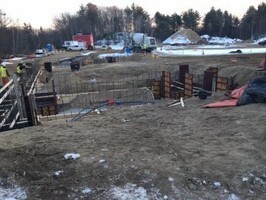 It is exciting to see the shape of the addition take place. Pictured is steel being hung for our new gym. What Will you Look Like at 100. 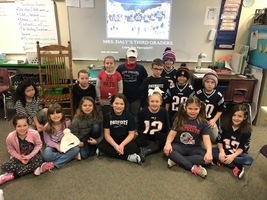 With the Super Bowl just days away, many of our students (and staff) are thinking about the New England Patriots playing in the big game. To build on this exciting time, students and staff had the chance to wear their favorite NFL team's apparel. It was not surprising to see that the most popular team apparel worn was for the Patriots. 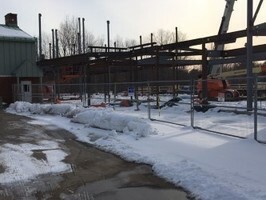 Even with the cold weather the work continues on the addition to our school. Pictured below are construction workers setting reinforcing rods for the foundation. 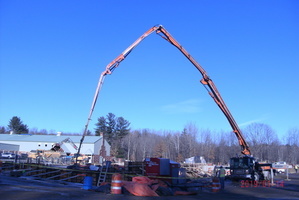 The next picture is of construction workers pouring concrete for another structural pad. 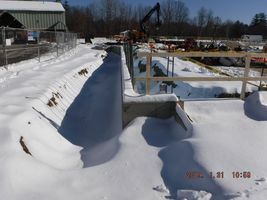 Despite the cold weather, snow and ice progress is happening for the foundation to our new addition. 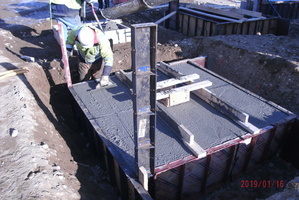 Pictured is one of the pads that was poured. 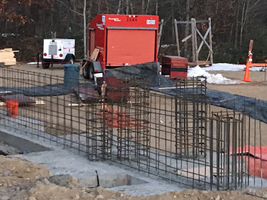 A poured pad for our addition. 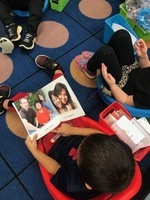 In kindergarten, the students learn strategies that all good readers use. 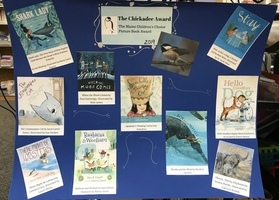 In our reading program these strategies are referred to as super powers. 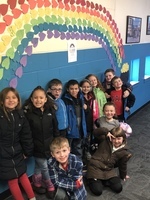 The picture is of Mrs. Ackroyd's kindergarten class's bulletin board where the students are asking everyone to inquire about their super powers. 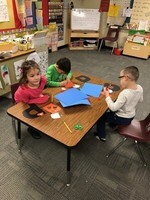 Students in Mrs. Hussey's class were counting, comparing, and adding sets using the appropriate math symbols in their project based learning activity. 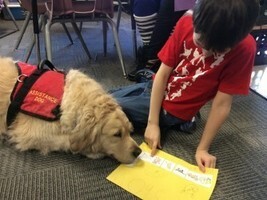 This student is explaining his math problem to Willow. 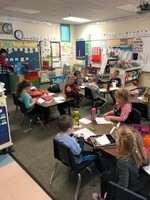 Mrs. Parker’s kindergarten class was studying “capacity” during their math lesson. 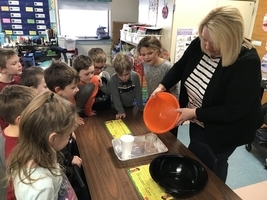 They used different containers and water to show which has more capacity. 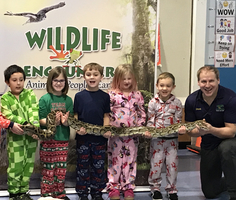 Kindergarten at Margaret Chase Smith School received a visit from Wildlife Encounters out of Barrington, NH on Friday. 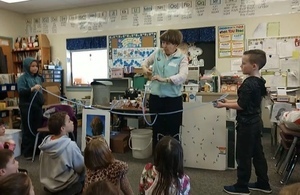 Derek, the presenter introduced 6 animals to the students, discussed their habitats and the adaptations the animals use to survive. Students were given the opportunity to touch two of the animals. What a great experience for all! 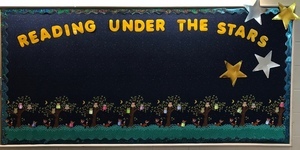 Mr. Potter read the book "Over the Snow, Under the Snow" to all the students. Mrs. Butler and Mr. Pickering led the school in singing holiday songs. 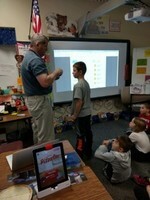 While walking around the building I stopped into Mrs. Leigh's second grade class. 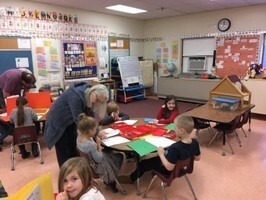 Her students were working on their nonfiction writing. 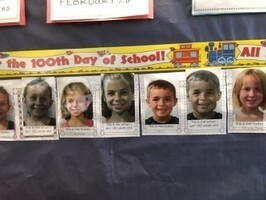 The boys and girls wrote facts about a topic or a "How to" book about a topic they know well. 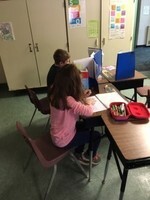 Pictured are some of Mrs. Leigh's students sharing their writing with her. 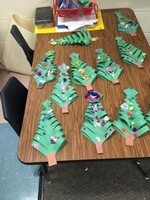 Kindergarten students in Mrs. Michaud's and Mrs. Parker's classes practiced following directions and their fine motor skills by cutting and folding to make these festive Christmas trees. 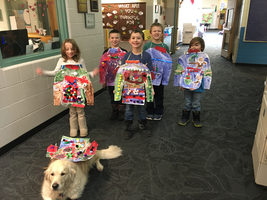 Mrs. Suratt’s students were working on patterns, following directions, and having fun so, the student created their own sweaters. Exciting news. 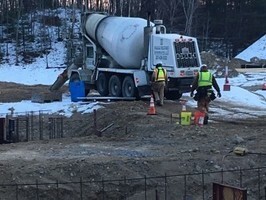 Yesterday PC Construction started having concrete poured for the foundation to our addition. 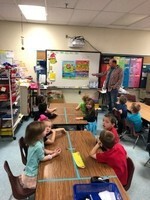 Pictured is Mr. Wilson who is one of Sanford School Department's technology experts making a teaching point to Mrs. Arnold's second grade students. 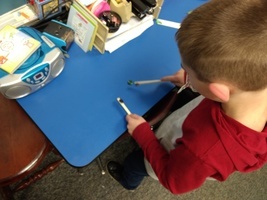 Above is one of Mrs. Arnold's second grade students using an Osmo for practicing skills learned in class. 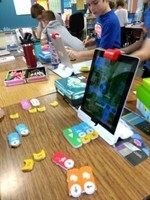 Students in second grade had an amazing opportunity to learn about and experience the amazing Osmo learning games. 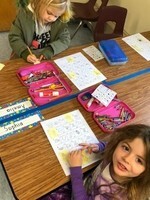 Mr. Wilson, one of the district’s technology experts, set up Osmos for the students to practice coding, counting money, spelling, creative thinking and drawing, as well as adding and subtracting. 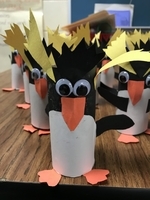 Submitted by Mrs. Arnold. 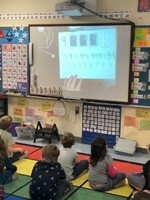 On Friday, Ms Badger's kindergarten students were learning how to read and write the number 9. Pictured is Mr. Wilkins, one of our P.E. and health teachers, teaching some kindergarten students about nutrition. 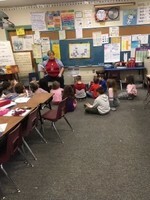 During a walk-through Mrs. Daly came upon Mrs. Parker's kindergarten students who were reviewing what syllables are. 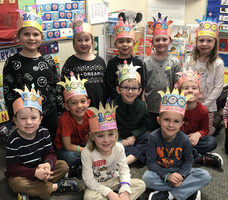 The K students in Mrs. Werner’s class we’re learning about the uppercase letter P.
Pictured is one of the sections for the foundation of our school's addition. 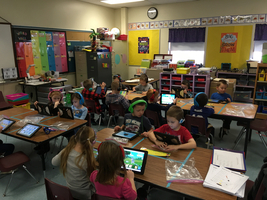 Mrs. Ackroy’s kindergarteners are using their iPads to practice their rhyming. 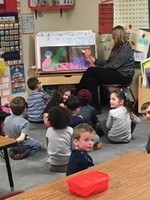 Our kindergarten students are learning to be Super Readers. 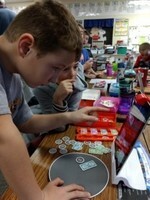 Their teachers are teaching them some strategies to help their students become readers. One of the first strategies students are taught is to point and match each word on the page with a word that he/she reads. 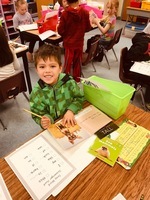 Pictured is one of Mrs. Ackroyd's student practicing his one to one matching as he reads. 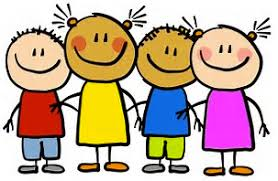 Mrs. Daly's 3rd graders introduced to our kindergartners all about our "The Right Thing to Do" Rally. 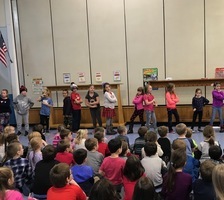 Ms. Hastings, Margaret Chase Smith's music teacher, led the third graders through a variety of songs that celebrated our veterans' service to our country. 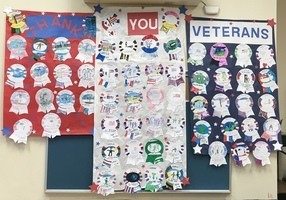 Pictured are some of the decorations students made for the school's Veteran's Day Ceremony. MCS students honor our veterans at a ceremony held at the school on Wednesday, November 7th. Watch the video by clicking here.